What is the purpose of the Janitorial Plastic Floor Signs? Janitorial floor signs alert the public to important information that can help them avoid danger or find help when they need it. The primary cause of injury in the workplace is slips and falls that can result in broken bones, muscle strains, dislocated joints, and injury to the head and spine. These accidents cost employers and businesses thousands of dollars. 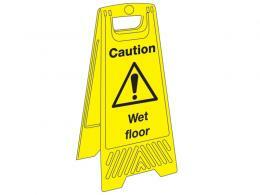 You can prevent falls by alerting people when cleaning takes place and the floor is slippery. 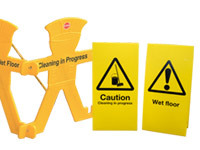 These signs fold flat for easy storage on cleaning carts or in janitorial closets. Their handles make them easy to store on hooks also. 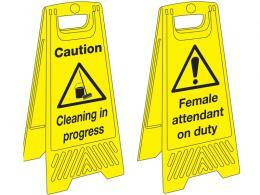 The cautionary signs can be used wherever cleaning is done and people need to be warned of wet or damp surfaces. The ‘Female attendant on duty’ sign is great for a Ladies Restroom to notify patrons that help is available if needed. 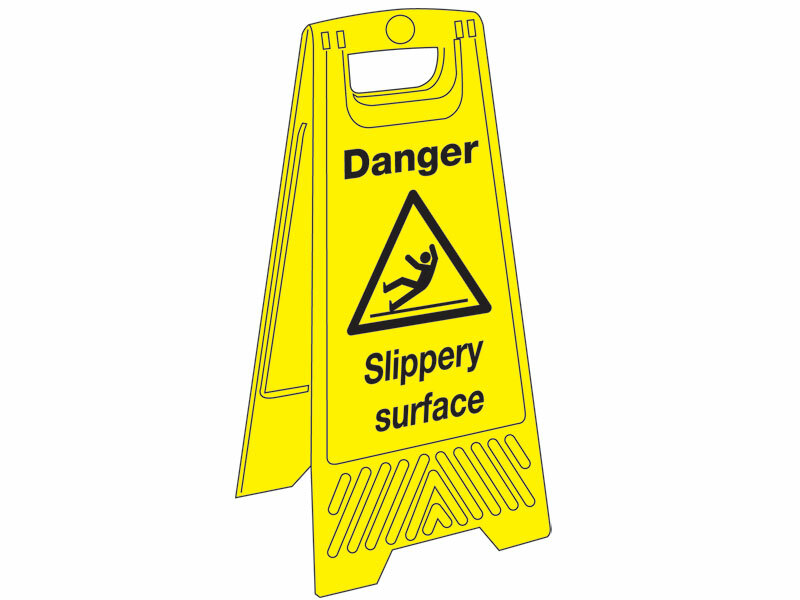 The cautionary signs are great for use by the janitorial staff, either the in-house janitors or the contracted cleaning personnel. The ‘Female attendant on duty’ sign is excellent for those businesses providing restroom services for ladies such as theatres or restaurants.